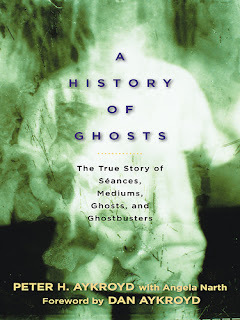 It's seldom I will shell out the cash for a hardcover edition of any book, but I grabbed up A History of Ghosts: The True Story of Seances, Mediums, Ghosts, and Ghostbusters by Peter H. Aykroyd and Angela Narth as soon as it was released. Why? Because I'm a hopeless fan of the Ghostbusters movies and couldn't wait to read about the actual events in the Aykroyd family history that inspired the films. Sadly, it was not at all what I had hoped it would be. I felt a little mislead by the title of this book, for one thing. It is not a historical look at paranormal activity at all - it is instead a summary of the Spiritualist religion in the United States and Canada. If you've ever been curious about the formation of the church and the most famous mediums from its first 100 years, this book provides a decent overview for the casual reader. Peter Aykroyd provides a glimpse at the researchers, like Charles Richet and Sir Oliver Joseph Lodge, who were out to expose the frauds in the field, but the author makes only a short reference to one of the staunchest skeptics out to expose the Spiritualist church - Harry Houdini. As so many of the mediums highlighted in A History of Ghosts were exposed as having resorted to tricks and deception, I feel the book could use a little more attention paid to those investigators, like Houdini, who revealed the most convincing trickery. The most colorful and entertaining parts of the this book were the tales of the Aykroyd circles (seances held in the dining room of the author's grandparents) and the communications between the family's medium, Walter, and his spirit guides. I wish that there had been more of these first-person accounts and less encyclopedic profiles of Spiritualist "celebrities", but alas, what is done is done. For those new to the ideas of mediumship and channeling, Peter Aykroyd does a wonderful job of explaining the practices of automatic writing, table tipping, early spirit photography, slate writing, materialization, and direct-voice mediumship. While he touches on the study of electronic voice phenomena (EVP), he is quick to discount the findings as natural artifacts of the recordings, while he openly accepts the spirit communications through a human medium as absolute truth. His lack of objectivity on the subject was incredibly frustrating for me as a reader (likely because our opinions differ drastically) but I'm sure such is not the case for all. I'm not really sure which events from the Aykroyd circles were those that inspired the author's son to write Ghostbusters as they were never clearly identified as such. Maybe the constant talk of spirit contact and the open mind the family has about the afterlife were more influential than any specific encounter? I guess only the Aykroyd men know for sure. I know it may sound like I've been harsh on A History of Ghosts, but I really felt like there was a bit of "bait and switch" going on with the packaging and marketing of the book. The content itself is a great overview of the activities surrounding the Spiritualist boom of the late 19th and early 20th centuries, and is ideal for those seeking a quick and easy read to introduce them to the subject, but a "history of ghosts" it is not. Overall, I give this book only one thumb up because of its weak cohesion. I encourage you to form your own opinion by picking up a copy and putting it to the test yourself. Peter Aykoyd is 90 years old and currently suffering from rapidly degenerating eyesight. To learn more about him, check out his interview with George Noory on Coast to Coast AM. It sounds like this wasn't what you were looking for, but if you wanted to read more about the Spiritualist movement, I can recommend two good books. "Lilly Dale - the true story of the town that talks to the dead" by Christine Wicker is an interesting book about the history and people living in this Spiritualist community. And then there is "Talking to the Dead - Kate and Maggie Fox and the Rise of Spiritualism" by Barbara Weisberg which gives an interesting and very readable account of the rise of Spiritualism in America. Hey, Dave! Long time, no see! Hope you're doing well :) I'd love to pay you a visit the next time I'm in your neck of the woods. Thanks so much for the recommendations. I've read the one on the Fox sisters and found it very intriguing. I'll put out some feelers on the other and try and pick up a copy! Hi Beth. I'm hanging in there. Feel free to drop by or give me a call the next time you are anywhere nearby! I will send you an e-mail with my contact info and phone number.